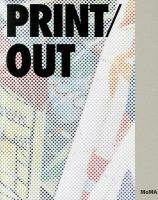 Print/Out, is organized in conjunction with the exhibition Printin’. Printin’ begins with 60 works by Gallagher (American, b. 1965). 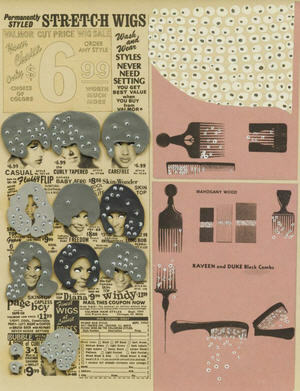 Gallagher pushes the idea of what is a print and uses mediums not usually associated with prints such as pomade and ice. The exhibit shows 50 other artists that begin with the 17th century to present day. Print/Out is an exhibit that brings together drawings, films, books, sculptures, videos, and comic strips. The exhibition features such artists as Vija Celmins, David Hammons, George Herriman, Robert Rauschenberg, and Martha Rosler. Over the past two decades, the art world has broadened its geographic reach and opened itself to new continents, allowing for a significant crosspollination of post-conceptual strategies and vernacular modes. Printed materials, both in innovative and traditional forms, have played a key role in this exchange of ideas and sources. This catalogue, published in conjunction with an exhibition at The Museum of Modern Art, New York, examines the evolution of artistic practices related to prints, from the resurgence of ancient printmaking techniques often used alongside digital technologies to the worldwide proliferation of self-published artists books and ephemera. Print/Out features focused sections on ten artists and publishers, including Ai Weiwei, Ellen Gallagher, Martin Kippenberger, Lucy McKenzie, Museum in Progress, Superflex and Rirkrit Tiravanija, as well as rich illustrations of additional printed projects from the last twenty years by major artists such as Trisha Donnelly, Felix Gonzalez-Torres, Thomas Schütte, and Kelley Walker. An introductory essay by Christophe Cherix, Chief Curator of Prints and Illustrated Books at MoMA, offers an overview of this period with particular attention to new directions and strategies within an expanded field of printmaking.